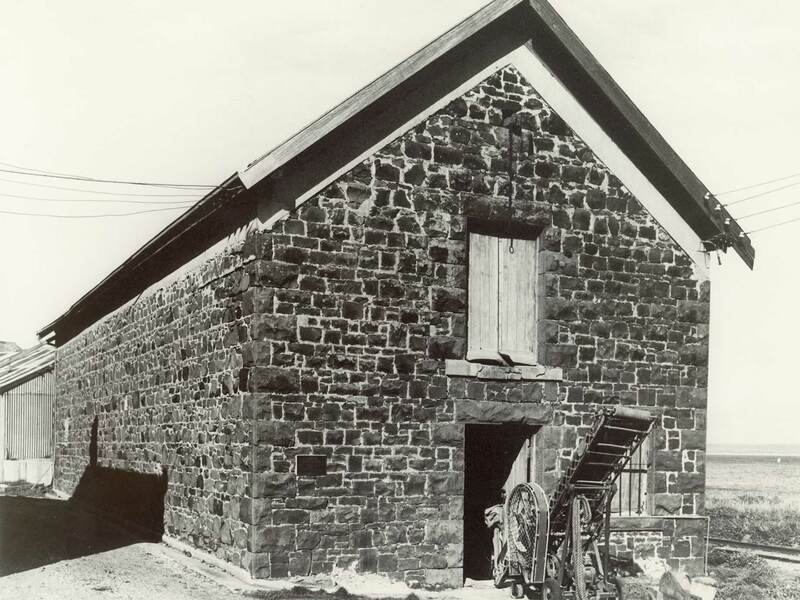 The bluestone Bond Store was built as a customs store in 1835 with Baltic pine and stone recycled from the ballast of early sailing ships. This is where ships would dock, and all the supplies suitable for a gentleman’s country estate were unloaded and stored before being carted to the chief agent’s residence at Highfield House. After serving as a store for many years, it was subsequently used as a bacon factory, and in more recent times a grain store, part of which is still evident in the building today. Meg recalled the clatter-clatter of the big grinding machines as the grain was fed in. Look closely at the rendering. 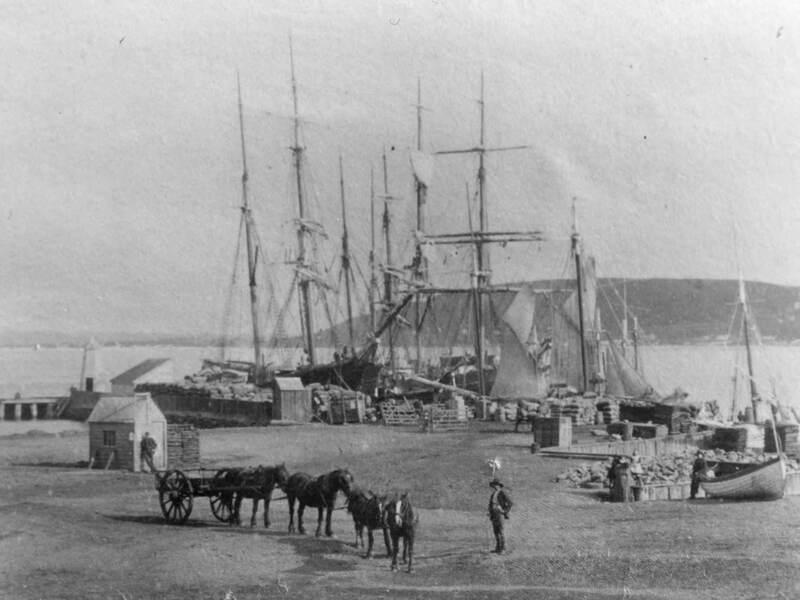 The lime was made from shells brought from Hunter Island in the old trader, The Prince of Wales. Look out over Little Wharf at the tuff, the molten volcanic rock that hardened millenia ago to form little rock pools where young Meg used to paddle and catch shrimp and periwinkles for tea. 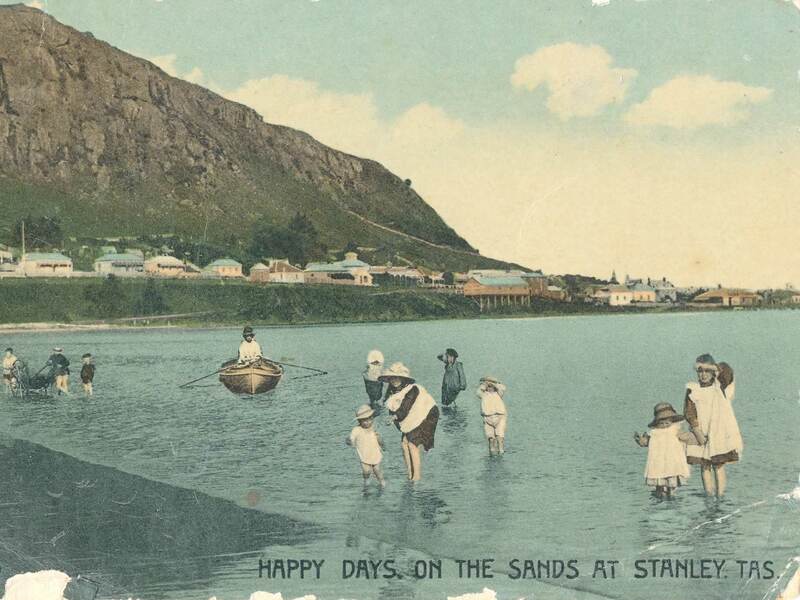 Old-fashioned postcards tucked in Meg’s scrapbooks read “Happy Days on the Sands at Stanley”, with pictures of families boating and girls paddling in pinafores, collecting the tiny white shells that were used to edge their mothers’ milk jug covers. Meg and Lin once rafted across the bay from here to Black River Beach to gather shells but found footprints of the Tasmanian tiger instead. Lin rushed back to fetch a camera and rafted the bay again while Meg waited for him on the shore. The photograph they took keeps their hopes alive that the Tasmanian tiger, last seen in captivity in 1936, might still survive, wily in the wild.